This is the mobile version of the board game. The completed interactive prototype is demonstrated here. I’d like to test on an iPhone via Flash. Based on testing I think 100k is a good payback amount but that is pre-encounters implementation. 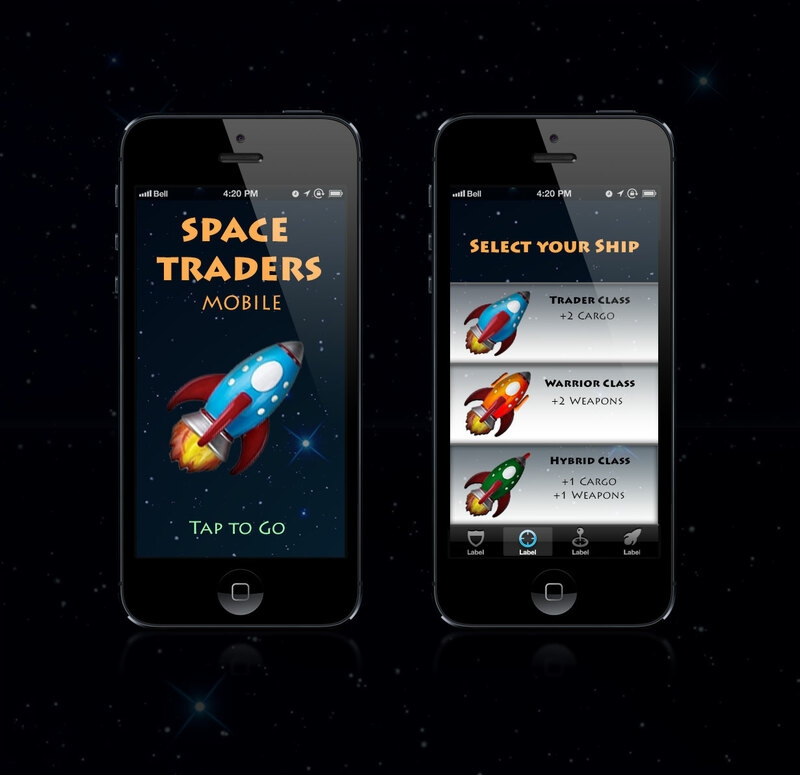 I have designed a digital mobile prototype based on my midterm project, A Space Traders Game. The idea always was not to simply replicate the gameplay digitally but to enhance it, making it appropriate for the mobile medium. This meant drastically changing the mechanics in some areas while maintaining the theme and overall feel. In this game a single player plays as a Space Tycoon who’s just starting out and needs to pay back a loan on his newly purchased spaceship. You have just 30 days to repay the space mobster to lent you the money before he sends his space goons after you to collect. You must travel from planet to planet adopting the age old ‘buy low, sell high’ method of expanding your fortune. Traveling the galaxy however is no simple feat and often ends in trouble or good fortune. This is reflected by random on screen encounters. On arrival at a planet destination each players can view the available planet Market which list a series of alien for sale. The players inventory is also available for trade. The game ends when a player is the first to reach their loan amount or fail to pay it in the allotted time. The digital version of the game is designed for a single player but has room to expand to player versus player over the internet or sharing a single device. The change made from multiplayer to single player was the largest design change since the original concept and the best one as well given the intimate nature of the personal handheld device. The context in which the game universe takes place is off a whimsical nature. Players interested in science fiction will have greater understanding and enjoyment of various pop culture references in encounters, lore, and general theme that would be polished into a final title. Additionally those who enjoy exploring the economics in a game will be the audience most interested in the subject of the game. Since a computer is involved math limitations that existed over the boardgame counterpart have been eliminated. I worked really hard to overcome programming inexperience on this project and I am very happy with how the prototype turned out. Emphasis for this project will be placed not on the design of the game and rules which were largely flushed out for the midterm assignment but in leveraging the benefits the digital medium has to offer as well as making the best possible user interface for the medium. The mobile platform will need to take into consideration Players sharing a screen or playing on separate devices. This opens open possibilities for new gameplay mechanics as players can no longer see each others plays directly. 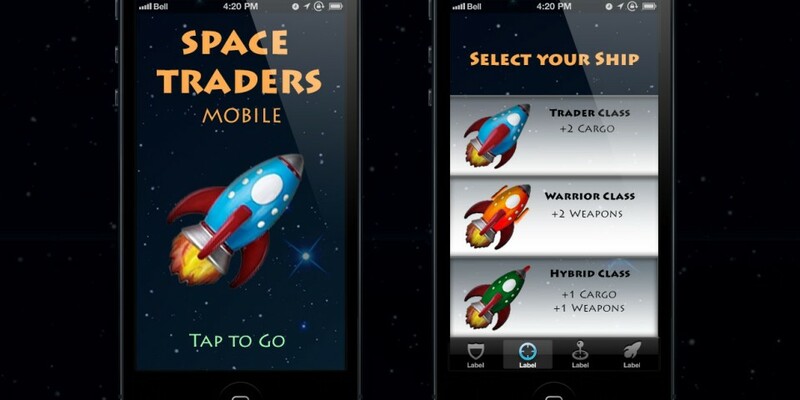 Players can now be represented by a digital version of space ship instead of a game piece. The digital medium solves some issues that I had with the board game like performing complex calculations. Only ten ‘random’ encounters have been preprogrammed into the game but hundreds could be included, pulling from a larger pool. Each encounter presents an interesting choice or scenario. The programming logic for these have not been implemented as it was out of scope for the prototype. While the primary opponent in this single player experience is fighting against the clock, scoreboards that displayed most space bucks earned, etc could be added to provide additional incentive for repetitive play. The feedback I received from classmates and testers was invaluable. I implemented several changes which improved the overall experience. I added visual feedback in the way of highlights to the menu system to help the user know when a selection had been made. I also added an animation for the ship flying across the screen, transitioning between different sequences in the game. This gave a breather to the play as well as provided a virtual feeling of moving from one planet to another. I choose this idea for my final project because it posed an interesting design challenge to me as I am primarily a user interface designer. Doing a mobile version over a standard computer version presented interesting challenges. For instance, I was limited by screen real estate and had to come up with interesting ways to manipulate the interface. The significance of this for me is trying to take a game concept that has been flushed out and adapt it to a new medium, taking in all that medium has to offer. At the same time the mobile medium has limitations and constraints that must be met. I believe this project will give me practical experience in operating under design constraints as well as having to think about how to migrate from a non digital platform to digital one.